Daniel was signed by the Lions as a free agent on July 29, 2018. 2018: Daniel originally joined the Lions for a mini-camp audition in April of 2018. 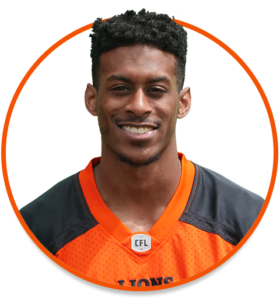 He was not invited to training camp with the club, but did land with the Saskatchewan Roughriders in advance of training camp in May. He was waived by the ‘Riders as part of Saskatchewan’s final roster cut-down in June and was brought back by the Lions late July. The University of Nebraska product was released from the Leos’ practice roster in October, but was signed to a 2019 futures contract. 2016-2017: Daniel began his pro career as an undrafted free agent signing of the Indianapolis Colts in 2016. He was claimed off waivers by the Tampa Bay Buccaneers in late July that year and eventually signed with the Miami Dolphins in 2017 before being released in May. 2012-2015: Following a redshirt year in 2011, Daniel appeared in 41 games for the Huskers tallying 46 solo tackles, two interceptions and 11 knockdowns. Born in Michigan but raised in Nebraska, Daniel was a gifted track and field athlete in high school. While at Nebraska he earned a selection to the 2015 Brook Berringer and Tom Osborne Citizenship Teams for his community outreach work.